The graphic design scene is still relatively a budding profession in the Arab world. The domain has significantly developed over the past decade by raising various creative challenges in developing innovative regional design. Many have succeeded in creating solid and influential design, yet a lot of work has been redundant and repetitive, introducing and establishing some obvious clichés that started to be seen everywhere. Here is our selection of the most redundant design choices to be seen in Arabic design, and hopefully to be avoided from now on. There is a significant obsession with Gold in the Arab world, from the actual metal to any representation of it. But really, how bling can your color choice be? 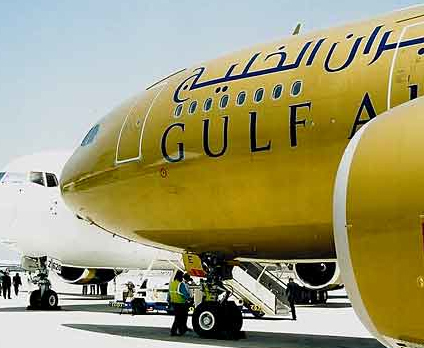 Gulf air went all the way, turning its fleet into flying golden pieces. They had all their planes painted gold. It is not really clear why gold became a color so popular and associated with the Arab world, but it seems related to the ongoing quest of representing luxury. What better way to do so than a literal reference to the material highly valued since prehistoric times. Golden logos, golden screen graphics, golden signage and golden interiors, clients seems to favor this choice and designers seem to find in it an easy way out. Pantone metallic 871 C stands high then on the cliché list. This is the typography that hope to illustrate a mix of ancient Arabia with a touch of more current oriental representation. The result is a big no-no: Latin typography that is built from Arabic letters, that is text that seems Arabic, but that is actually not. No example is better to illustrate this cliché trend than the logo of Abu Dhabi, and the custom typography done for it. The concept of the brand of Abu Dhabi is to create an identity that will stand still all the way until 2030. Tough task when its branding seems like a cliché in our current times, let alone 20 years ahead. to haunt designers. Let me explain – clients appreciate the success of certain brands and appreciate the accomplishment of their identities and so start asking for similarities. Literal ones. The brief then simply becomes summarized as a request to design “another Al Jazeera logo” or “a replica of the Emirates airline logotype.” A frustrating situation when the client becomes, with the cooperation of the designer, shopping around for logos “off the shelf” and crossing the thin dangerous line between being inspired by good work and reproducing alike solutions. The first time I saw a camel was in a European zoo, despite growing up in an Arab country. Contrary to all belief, there are no camels wondering the streets of all Arab countries. Using and abusing the iconography of a camel in the Arab world is like using a windmill to represent the Dutch, German, and Belgian cultures! It is simply weak and inapplicable to the large geographic area of the Arab world. Nothing against the Camel, but graphically it is simply overused. Wait overused is an understatement even; it has been raped as a concept and left dry. Notable runner-ups in the cliché animal categories are the Falcon, the horse and the Oryx. Not many arguments are needed to show that the palm tree was turned into an ultimate cliché element. After all, an entire island was built with the shape of a palm tree. The golden palm trees of Dubai airport were not enough of course, and the palm had to be made into a landmark visible from outer space! When the entire strategy behind a brand has to be visible within the logo mark, a storyboard turns into a logo. All-inclusive logos could surprisingly contain a lot of narrative elements, and subsequently drive away from abstraction or from the modernist logo design practice. Some of these logos are not necessarily visually badly designed (thought most of them are), but the literal illustration of a story in the form of a trademark seems to be an unfortunate flow of visual communication practice in the context of visual identities. 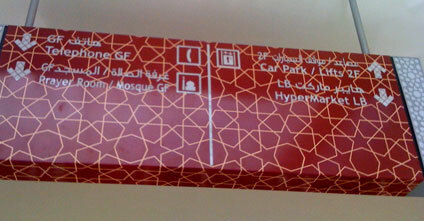 Some elements are used almost by force to set an Arabic mood that seems more “exotic” than authentic. Arabesque patterns can be a simple example: They are part of the rich Arabic visual culture, yet when the most common and overused basic arabesque pattern is stuck as the ornamental background or main element of a project, it shows nothing but a failed attempt to localize a certain graphic language. Arabesque patterns are complex and a field to be investigated on its own. Using it without any real effort to explore its possibilities falls in the same trap of making design choices that convey a preconceived faulty reflection of an exotic image of the Arab world. The same patterns are overused again and again. The above example, a signage in a shopping mall, is a double-trouble example. A repetitive pattern choice used in the most inappropriate context, making the legibility of the text on the sign very difficult. The rich and diverse heritage of visual culture in the Arab world can sometime be used in a traditional way that risks to look old fashioned. It is natural that even very classic elements tend to be reinterpreted in a contemporary context. Doing that in the most obvious way seems to be one of the most common clichés, what we call traditional 2.0 (or even Islamic 2.0). An example of this would be taking the most classic calligraphic (and ornamental) styles and coloring them with computer generated flashy gradients. Popular visual culture can always have its own charm- yet there is a specific popular design language that is far from following any design or layout rational and that is a combination of computer layout abilities, cheap advertising form, and loud commercial character. Nothing illustrates this more than the most common mass CD cover designs widely visible across the region. They are just a group of chaotic random messy designs. They say clichés become clichés for a reason. The fact is today that these repetitive solutions are overused and have worn thin and will take us further from creating any innovative and sustainable design solutions much need in the region.